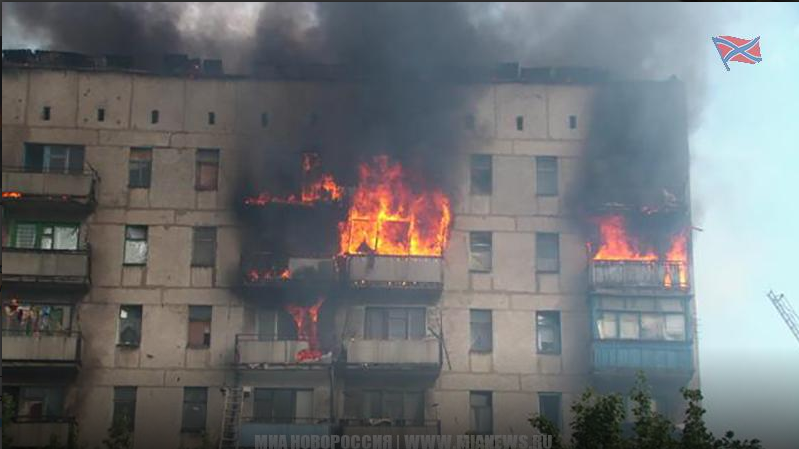 Ukrainian war criminals* shell Kiev Region; condominium building in flames. Kiev junta “punishers” shelled the civilian population of the Kiev region of the Donetsk People’s Republic’s capital city. Fire broke out in the explosions. The press service of Donetsk city administration reported on the bombardment. “Today the Kiev region took fire from the APU. one of the blasts hit a residential building on Putilovskaya Grove, resulting in a fire. Data on casualties are yet to be reported,” the mayor’s office reported. The headline writers are past being out of civil patience. What I have rendered “war criminals” is выродки, “degenerates.” Each is a good fit. Enough! After shellings on civilians and water treatment plant, Donetsk returns fire.